The sight of a demonic skeleton, baring his teeth in rage as he charges towards you and dressed as a warrior armed with a Union Jack flag is enough to scare anyone. Except die-hard Iron Maiden fans that is. 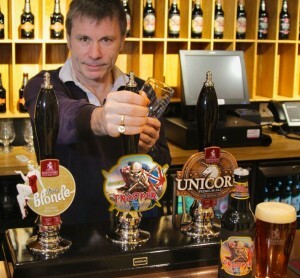 It’s the label on the Trooper bottle, the beer brewed by Stockport-based, 175-year-old brewery Robinson’s in close consultation with the band’s lead singer and real ale enthusiast Bruce Dickinson. Thousands of them worldwide will have enjoyed their first ever sip of the alcoholic rock juice designed for them to feel closer to the band they idolise. The first few bottles were shipped out just before the weekend. Pre-orders were secured from 184 countries around the world. Much of those propelled, no doubt, by the mounting online excitement amongst Iron Maiden’s 8.8 million-plus Facebook fans, when the release of Trooper was announced in March. So putting my beer sommelier hat on, I tasted a bottle of Trooper. At 4.7% (it is 4.8% in cask) it pours a deep golden colour, so deep it verges on copper. I get caramel, earthy/grassy notes and a hint of lemon citrus on the nose. All very subtle, but no real punch in terms of aroma. 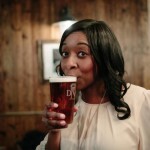 That subtlety translates into the flavour of a delicate sweetness, a light dry finish with no lingering bitterness: all-in-all, a well-balanced brewed beer from the brewery which has made its mark when it comes to celebrity beers. However, this beer doesn’t wow me. I was expecting the beer to charge at me, inn the same way the song from the band’s fourth studio album veritably screams. The way the British cavalry in 1854 would have done when charging the Russians. I yearned for something loud, punchy and rebellious. But instead it was quiet. Unassuming. Almost tame. 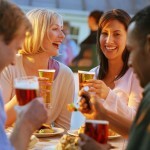 However, everyone’s palate is different and I love strong beers. Let’s face it, I’m not an Iron Maiden fan, and this beer’s been produced with them in mind. 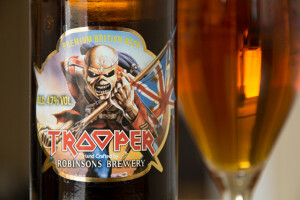 As Bruce explains in the video, Robinson’s Brewery wanted Trooper to be brewed large-scale and long-term. Yet it also had to be a beer that super-fans would lock on to and hold dear for years to come. 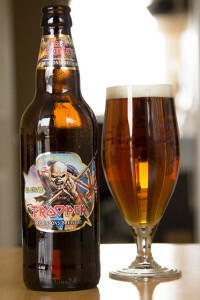 Therefore Trooper had to be universal to appeal to the palates of beer drinkers across the board and around the globe. It had to be inoffensive and – above all – drinkable. By the pint, by the bottle, by the crate. And not, like a real Trooper, knock you straight out in a sip. This is a “session” beer in the truest sense of the word. I can see groups of fans gathering around the stadium bar, supping a couple of pints before watching Iron Maiden take to the stage. I can also see the guy who missed out on a ticket to that same gig, settling down at home to listen to the 30-year-old Piece of Mind album on his loudest headphones he can find, whilst cracking open a bottle or two. But there could be a global battle of “badass beers” brewing. 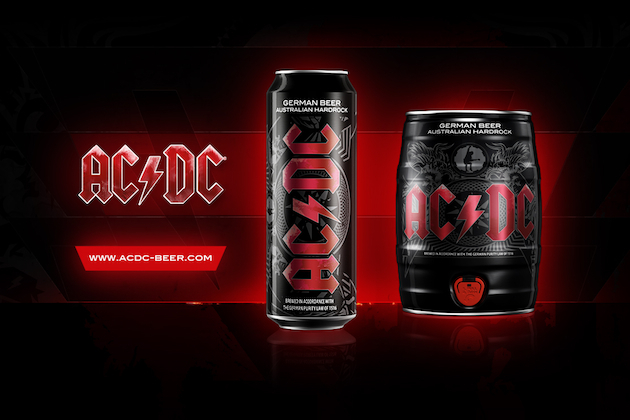 AC/DC is all set to launch worldwide shipping of their very own premium lager at 5% ABV, so Iron Maiden is now marching into the territory of one of its closest rock rivals. But the battle will be hard-fought with Robinson’s on the battlefield alongside them. The family brewery won the hearts of fans of multi-platinum selling Manchester band Elbow in launching the Build A Rocket Boy beer, almost 18 months ago. Sales helped to raise well over £25,000 for the Oxfam East Africa Appeal into the bargain. If ever rock beer warfare does ever break out, Trooper’s most definitely ensured that Iron Maiden fans will have an army of fans defending them to the bitter end. The Brazillian metal band Sepultura have a wheat beer.Another one to check out! WOW! Let battle commence, eh?!?? Must look out for that – have you tried it? What is it? A lager? An ale? What’s the strength, the colour? Have you tried it?